You don’t need tall WRs either. You just need quick guys who get open. You need a very creative coaches. Im not sure how creative Silks is but BB pretty much reinvented his defense in two weeks. The rams had no idea what they were doing. Offensively, it seemed like the Pats went against everything that got them to the super bowl. They messed with every tendacy they possibly could and threw just about every running concept at the rams outside of QB designed runs. The Pats opened up their offensive run plays with 6 different concepts and ran 10 different kinds of concepts through out the Super Bowl. That’s is pretty impressive. A lot of teams will run the same concepts out of different formations but the Pats ran 10 different run concepts in and out of different formations and personal groupings. They won that game because of their coaching. BB on defense and McDaniels on offense. McDaniels knew the rams DL would give them issues, so he made a game plan that threw everything at them, so they couldn’t key on anything than tee off. By doing that, it never really allowed the rams defense to have a great series and turn it into great field position for their offense. I remember Plaxico Burress making the game winning TD again the Pats. there have been big receivers that made big players in the superbowl I dont think you can or can't have any specific thing. I think defense is the side of the ball where you can you need certain skillsets. You've got to have corners, safeties, and dline pressure, and a leader at a linebacker position who can get everyone in place. Great content in the Browns forum as usual. In Super Bowl LII, Brady had 505 yards, 3 TDs, and 0 interceptions. Patriots lose by 8. In Super Bowl LIII, Brady had 262 yards, 0 TDs, and 1 interception. Patriots win by 10. 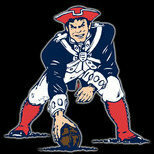 I’ve been a Patriots fan since the 1985 season, and I’ll NEVER understand this team. I don’t think it’s a matter of finding guys who are big or fast or tall or short per se, it more so just finding guys who have a trait or multiple traits that allow them to win matchups. Whether the WR wins by utilizing exceptional route running, elite speed and quickness or just being big and bullying defensive backs is irrelevant tbh, they all work. They just need a trait to rely on. Juice is interesting in your frame work because he basically doesnt separate, he has exceptional hands and wins in zone but basically not man until the play breaks down, or when it is a very specialized route, like out-up-curl. He wins with quickness, route running and the ability to catch the ball in traffic. He’s a guy who doesn’t have to be “open” to throw him the ball.